Till now, Linux has only under 3% share on laptops/desktops. But once you get familiar to using Linux, it's pretty hard to live without it. Here's a list of 5 Linux distributions for laptops to find out which fits best for your purpose. First I want to say that almost every Linux distro has the flexibility to customize it according to your need. But it could be quite time consuming, also confusing for new linux users. Another important point is we're talking about laptops, not netbooks. Now days most laptop packs enough power to run any distro with any desktop environment. So, here's the idea of a list, with enough reasons why you should pick that particular distro. Lets get started with the list. Ubuntu or Linux Mint need no intro, and more or less they're the same linux disro. But why should you use Ubuntu or Mint on your laptop? I think if you don't want to spend much time on trubleshooting or experimenting, you should definitely use them. Ubuntu or Ubuntu based distros are most used Linux distro, so if there's a problem, probabbly it's already fixed. Another good thing about Ubuntu is their package update interval. It's neither too frequent nor too late, just in time, and canonical tries their best to apply security updates as soon as possible. If there's a NVIDIA Optimus or AMD switchable GPU on your laptop, then using ubuntu on the laptop have another significant advantage. Much less hassle to get them working. Like others, Ubuntu is not a totally glitch free distro, infact there's a lot, one of them is the default Ubuntu kernel. But if you're a bit adventurous, you could try to compile custom kernel and use it instead of the default one. So in my point of view, till now Ubuntu is the best linux distro for laptop. Here's a step by step guide to dual boot ubuntu for beginners. openSUSE is another strong contender in this list as the best linux distro for laptops, maintained a steady position amoung top 10 linux distros. If you're an advanced Linux user and need something that just works out of the box, then openSUSE is best for you. Though openSUSE installation is and GUI interface is fairly easy, but it takes some time to learn it's advanced utilities like the zypper package manager and YaST settings manager. openSUSE also has a large community of advanced users. So if there's any problem with openSUSE, the community is ready to help you. As of package management and update cycle, it's just as good as Ubuntu, if not better, but you need to learn zypper and rpm before taking the advantage. All three of Fedoa, CentOS and RHEL shares the same internal architecture, with slightly diffrent package management system. So there's an inherent advantage of installing Fedora on your laptop, if you've to deal with servers, virtualization, SElinux and similar technologies. As CentOS or RHEL is extensively used on servers. There's also many spins of fedora, each targeted for a different user base, from gaming to servers to scientific computing. You can choose different Fedora spins depending on your need, and enjoy out of the box experience. Fedora's package management system is also very neat and clean, heavily maintained. You can anstall almost any Linux software with DNF, and popular "less open source" softwares from RPM Fusion repo without compiling them. So in my point of view, Fedora is the best linux distro for laptops if you're a server guy or sysadmin. The base of every popular Linux distro, runs on most hardware platform, forked endlessly, here's a comprehensive debian fork list. But Debian poses some serious challange for begeinners. There's many release, stable, testing, unstable and rolling, which is better? There's many ISO file available for download, which one to download? The debian installer is also not so newbie friendly. Some may also face problems with missing NIC firmware, GPU drivers and like so. Debian has another glitch, the stable version doesn't packs enough latest software in it's repository, which is not great for a regular use distro. Fortunately the unstable release(Sid) is stable enough and has most recent software in the repo. But for advanced users, who don't need to install much software/development tools and can go with few bugs, probabbly Debian unstable is the best linux distro for laptops for them. It's much more modular than ArchLinux, Fedora or openSUSE, but less than Gentoo. So if you need a rock solid system on your laptop use Debian stable. Use testing/unstable/rolling if you need the latest software with frequent updates, ignoring minor bugs. If you're Arch Linux fan, then Antergos could be your choice. And for beginners, it's one of the easiest way to try Arch Linux. As based on Arch Linux, Antergos has all the goodness of Arch, and a ever growing experienced user community. Antergos has all the latest software in it's repo, just like Arch Linux, but packages are updated too frequently. So don't expect a super stable OS, specially if you'e heavy stuffs like KDE plasma desktop, Gnome 3 and other relatively new software. Regarding as a laptop distro, Antegros has all you need to to run it perfectly on a laptop. But again, Antegros has very frequent package update schedule, not great if you've a capped internet connection. If you've an old laptop, a netbook or a chromebook, you should consider these 3 lightweight linux distros listed below for your laptop. Many old laptops don't have enough computing power(specially RAM) to run a full blown KDE or Gnome3 desktop. So to efficiently run Linux on those laptops, you need something lightweight. On old laptops battery backup is also an issue, as the battery may be weared out. You might need something fancy to alert you when battery is low. This list doesn't include few very lightweight yet usable Linux distro like SLITAZ, ANTIX or DSL as they're primarily used as Live USB distro. A relatively unknown yet highly developed Linux distro, targeted for laptops. If you're concerning about the battery backup of your laptop, then wattOS could be your choice. wattOS is based on Ubuntu, so you can enjoy all features of Ubuntu, plus all the tweaks to maximize battery life. It available to download in two different flavors, i3 WM based Microwatt and LXDE based wattOS LXDE edition. Another Ubuntu based distro, but with a highly customized lightweight LXDE desktop. Lubuntu also has some preinstalled lightweight versions of alternative softwares like Abiwords insted of LibreOffice, Gnumeric instead of LibreOffice Calc, Mutt mail client and so on. It's one of the best linux distro for old laptops. I think Lubuntu as already very popular, so i'm skipping all those unnecessary fuzz, just get it from the link below. A fast and lightweight Linux distro for chromebooks. If you've a Intel based chromebook, then you should give it a try. GalliumOS is also based on Ubuntu, uses XFCE as it's desktop environment. The best part is it already patched to run on a Chromebook, and the developers are fixing bugs as soon as they're fund. GalliumOS is still under development, not every chromebooks are supported, check the compatibility list before downloading. Each of these distros are tailored for different type of users of different needs too. But at the end, any of them could be modified for a specific need. All of them have good hardware support, backed by large communities, used by millions. So it's hard to tell exactly which is the best linux distro for laptops. 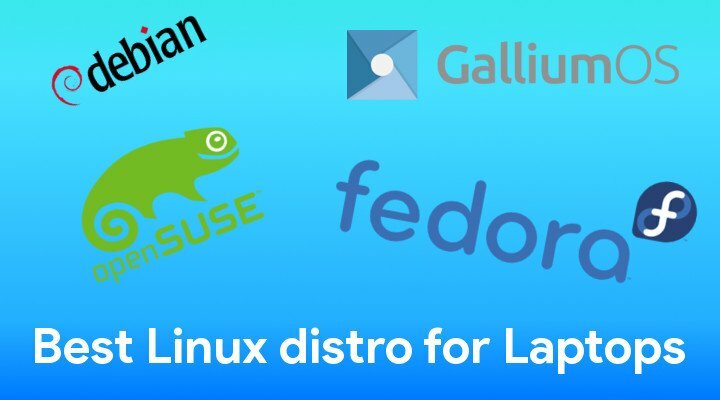 Thare's many other popular distro are missing from this list, but I think it's enough! What's your though about these distros? Which distro you use on your laptop? Does it work at all? Works on LENOVO? Well. There are a few other noble contenders for the top 3. I'll mention only ones I've used. Vector linux also gets my mention - not the greatest with software ease/availability. WARNING. But if you're willing to compile. It gives you a great platform - its fast and stable. Believe it or not I also used a really stripped down version of opensuse (50mb) Distro. LXDE. Was great. Cant find that image though and its not as light as the other 2 I before, so it only gets an honorary mention. But I used that distro for well over a year and it was darn fast too. Currently I used antix for older laptops. Opensuse or MX linux for anything in between and Fedora Linux / MX for my main Rigs. Thanks for mentioning other lightweight distros. Yes, I use SLITAZ regularly as a live USB for testing and troubleshooting, very much usable. I've had it installed on 3 old 10" netbooks for 6 months or so. It has a very small footprint as regards hard drive space. Also very stable. Yeah, I'm aware of this distro. Used it once for testing, works out of the box.